About 4.5 million people have dementia in the US. Thanks to the fantastic work of palliative care researchers like Joan Teno, Susan Mitchell, Jane Givons, and Laura Hanson we know a tremendous amount about the experience of dementia for people residing in nursing homes. Although the nursing home is sometimes the final place of residence for persons with advanced dementia, many people reside in the community with dementia for years, including the end of life. In fact, about 25% people with dementia live in nursing homes. The remaining 75% live in the community, either in private residences or residential care facilities. Unfortunately, compared to the experience of dementia in nursing homes, we know very little about the experience of dementia among community dwelling older adults. It's a relief, therefore, to see this issue covered in the most recent issue of JAGS. In a study of about 800 community dwelling older adults enrolled in the National Health and Aging Trends study, Lauren Hunt found that about 6/10 people with dementia report bothersome pain and 4/10 pain severe enough to limit daily activities. People with dementia and multimorbidity were at greater risk. 1/3 of those with bothersome pain were not taking pain medications for pain. In a study that matched 1,188 veterans with dementia prescribed a cholinesterase-inhibitor at an outpatient pharmacy with 2,189 veterans with dementia prescribed another chronic disease medication, Meera Sheffrin found the risk of 10 lb weight loss was 6% higher at one year for veterans prescribed cholinesterase inhibitors. The number needed to harm was 21. In a study of 3,447 people with dementia enrolled in the Health and Retirement Study, Chris Callahan found that transitions in site of care were common. 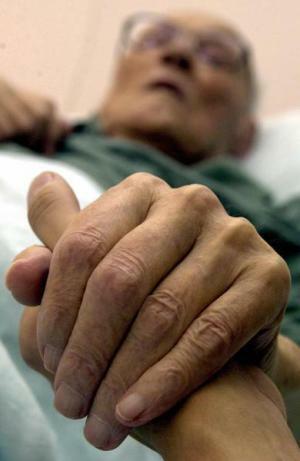 People with dementia experienced 0.8 hospitalizations per year and 0.3 nursing home stays per year. The most common route to the nursing home for people living at home ran through the hospital (ie home to hospital to nursing home).Of the 68% of the sample that died during the 10 years study period, about 60% died at home. What can we take away from these data? Pain is common in community dwelling people with dementia. Nearly 2/3 people with dementia have bothersome pain. Many people with dementia living in the community are able to report current levels of pain. Pain is likely undertreated. Although we often disclose the minimal to no meaningful benefits of cholinesterase inhibitors, our discussion is often met with, "Yeah, yeah, but doc, we have to try something, and our insurance will pay for it. What's the harm?" Well, add to the list of potential harms a 10lb weight loss for one out of 20 people. That's a serious amount of weight loss for a frail, older adult with dementia. People with dementia transition back and forth between home, hospital, and nursing homes like Ping-Pong balls. If we want to intervene to delay nursing home placement for community dwelling people with dementia, the most important site to intervent may not be the home or the nursing home. It may be the hospital, which severs as a conduit to nursing homes for people with dementia living at home. The nursing home is not the most common place of death for community dwelling people with dementia. It's the home. Our nation lacks a coordinated system of formal and informal care to provide for the daily symptom and functional needs of community dwelling people with dementia. This lack of coordination is potentially disastrous given the aging of the population and lack of prospects for a dementia cure in our lifetimes. Is there a role for the Coordinated Care of a Chronic Condition Code here? My greatest surprise in implementing a new palliative care consult service was the percentage of my referrals was for those with dementia was close to 25% as a primary dx. The limited resources, caregiver burden, managing disruptive behaviors, and defining goals of care in the context of a prolonged trajectory are a challenge in providing meaningful support to patients and families. We need to continue to support research in this area to help guide best practices and improve care to this population. I agree that hospital care should include the goal of keeping demented people as functional as possible to try to help them return directly home. Another wrinkle is that people who may need nursing home care end up in the hospital because a) our payment system covers subacute (skilled) care after a qualifying hospital stay, but not coming directly from home, and b) hospital discharge planners know how to get people into nursing home beds. In our community it is very difficult to find a physician to follow his/her patients in a nursing home. The primary care providers don't want to take calls and complete the increased paperwork for nursing home patients. Unfortunately this fragments care even more.